Sweden: SE UCH, CACIB, CAC, 3x R-CACIB, 5x R-CAC, 2x BOS, BOB-Junior, BISS-4 Junior. BOB Intermediate. Several CQ & best male placings in every country he is shown. Best Open Dog, Best Male, BOB & BISS-2. Nominated for best temperament & best head competition. CQ BM-4. BISS-3 Brace with his daughter Leona. CQ, BISS-4 Brace with his daughter Leona. CQ, BISS-2 Brace with his daughter Leona. Nominated for best temperament, best head & best movement competition. 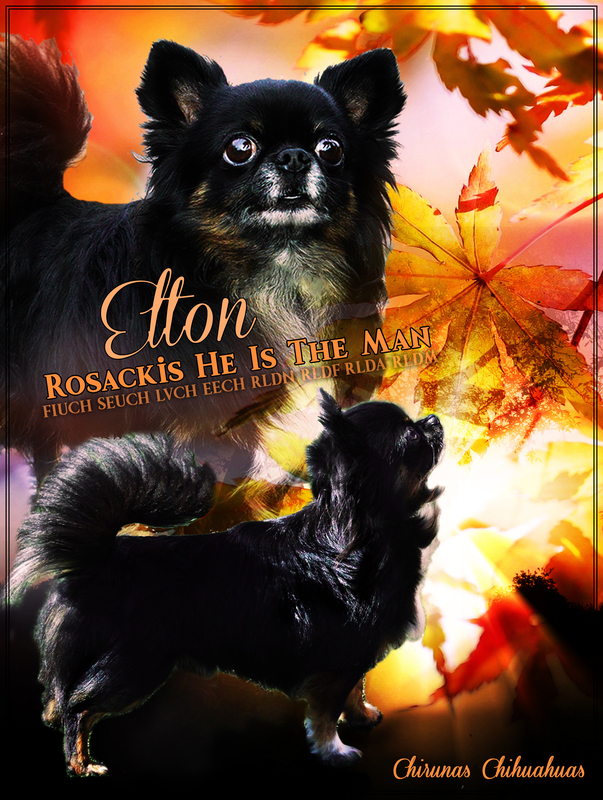 * Elton was also 15th mostwinning chihuahua longcoat in Norway 2013.